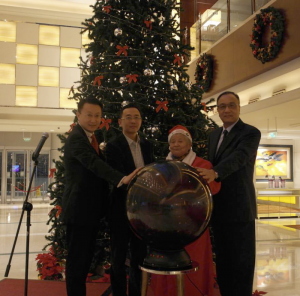 Shanghai, China, December 18, 2015 /ChinaNewswire.com/ - Crowne Plaza Shanghai Fudan held the 2015 traditional Christmas Lighting Ceremony, and shared the joyful moment together with the "Santa Claus" from Yangpu Social Welfare Institution. Picture shows the “Santa Claus” in Yangpu Social Welfare Institution (2nd from right) with Mr Shen Jiarong, General Manager of owner company (1st from right) and Mr. Robert Shi, General Manager of Crowne Plaza Shanghai Fudan (1st from left). The Yangpu Social Welfare Institution is part of the local Yangpu government in Shanghai, and assists with the upkeep and living of the area's elderly residents. The Crowne Plaza Shanghai Fudan hotel is next to Fudan University and provides dedicated service and easy access to the city's business and leisure hotspots. 309 elegantly decorated guest rooms including 34 suites with five-star facilities and amenities were designed to satisfy all the expectations of both the international business and leisure guests.